"EU history","CIA and European Movement","European Movement","Winston Churchill"
After the end of WWII in 1945 and the ravages of that war on the continent of Europe a landslide election result in Britain swept a Labour government into office and tipped Churchill out. Churchill had been a successful popular wartime leader. In 1946 Churchill delivered a speech evangelising European unity in the form of a federalist United States of Europe (USE). However, Churchill was adamant this was for mainland Europe and not for Britain which retained imperialist interests in the Commonwealth of former colonies and dominions. This is the source of confusion and why both some of those opposed to and for the European Union try and claim Churchill for themselves but it is clear he was all for a USE but without Britain. 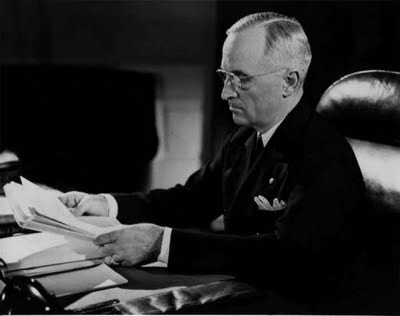 In 1947 the Truman 'doctrine' was declared as "the policy of the United States to support free peoples who are resisting attempted subjugation by armed minorities or by outside pressures." (2) This doctrine became a main plank for US foreign policy and was recognised as the start of the 'cold war' with the USSR and to prevent countries taking the alternative to capitalism namely a socialist economy. Churchill publicly endorsed this doctrine. J Foster Dulles who had apparently been a Nazi sympathiser(3) and was now Secretary of State when Eisenhower was President. 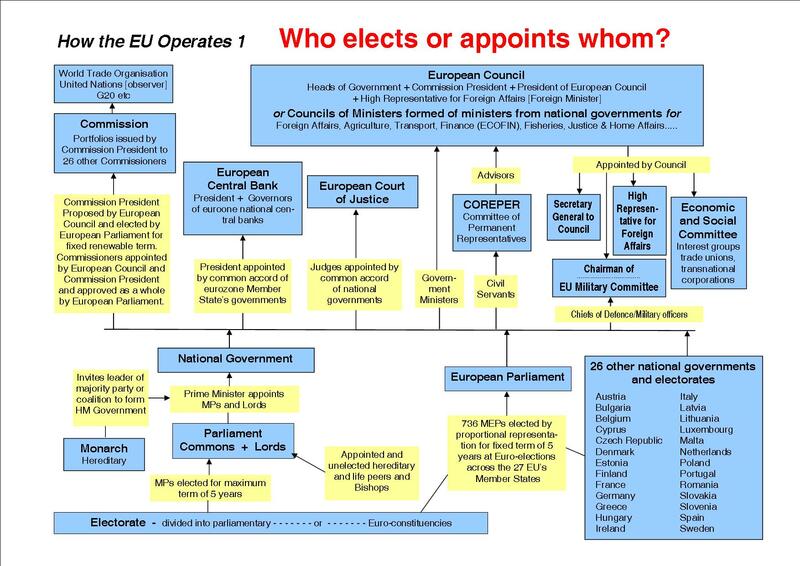 Dulles voiced US ruling circle aims for the creation of an "economic and political association" of Western Europe in which West Germany would be involved to replace the "structure of independent unassociated sovereign ties". 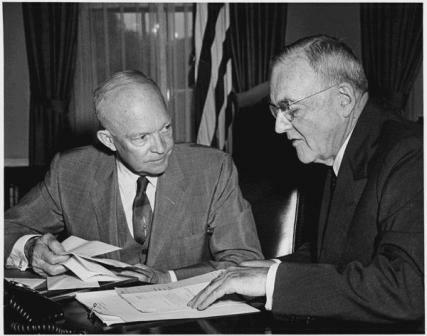 Shortly after the Truman doctrine the European Recovery Programme (ERP) or Marshall Plan was announced by this US Secretary of State whereby funds would be passed to west and southern European nation-states and Turkey. This was the practical economic side of the doctrine to prop up capitalism and fend off socialist aspirations and was supported by Britain but opposed by the USSR. The money flowed for three years from 1948 to 1951 and totalled at the time to $12.5 billion. At the same time the military aspect of the doctrine was advanced in the form of a political association which became NATO. As well as economic advisers the US sent military advisers to countries "threatened by communism" which included Greece and Turkey. 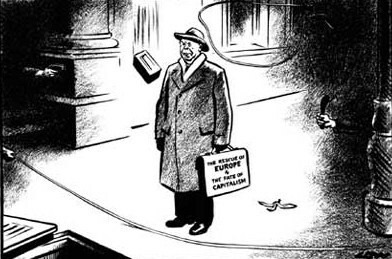 Ambivilant cartoon by David Lowe on the Marshall Plan. Whilst negotiations were being conducted to put in place the European Defence Community (EDC) (see part 2 of this series) other parallel talks and proposals were on the table to set up a European Political Community. The six States in the European Coal and Steel Community gave the task of drawing up a Treaty for EPC to the ECSC's Assembly. A Constitutional sub-committee was formed to draft a federalist constitution which included a two chamber parliament with a directly elected lower house and a European Senate with nationally appointed delegates. The plan included a Court of Justice and an Economic and Social Committee. In these negotiations the Dutch Government proposed there should be a common market amongst the six States. This aspect was not followed through as it was opposed by some nation-states which wanted to retain tariffs and quotas on trade. In the background and largely out of sight was the rivalry between different imperialist interests including those of the USA. The European Movement didn't have political power but was a well-funded propaganda machine to advocate a USE in western and southern Europe. A previous advocate of a 'United Europe', Napoleon, always sent in the scribes before the troops and occupation! In parallel to talks about a common market and an EPC were discussions in the Council of Europe about a European Agricultural Community. This foundered for several reasons including a veto by Britain which had at the time trading partners in agricultural products with former colonies and dominions of the British Empire now called the "Commonwealth". Two proposals for a European transport authority were launched in 1950. 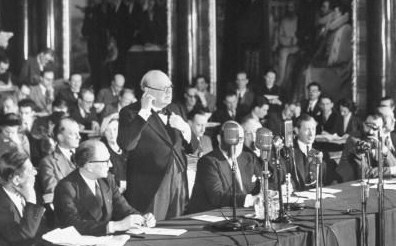 The outcome was the formation of the European Conference of Ministers of Transport (ECMT) with an HQ in Paris in 1953. The reluctance of States to give up sovereignty over this key aspect of economic life led to the ECMT turning into a talking shop. The draft treaty for EPC was adopted unanimously by the ECSC Assembly and put before the relevant Foreign Ministers. Negotiations gradually stalled because of differences between States over who should have power and whether or not the EDC should be ratified all round first. The coup de grace to EPC was delivered in 1954 by the deputies in the French Assembly who threw out the European Defence Community project. However, the federalists pursued their goal along several tracks. 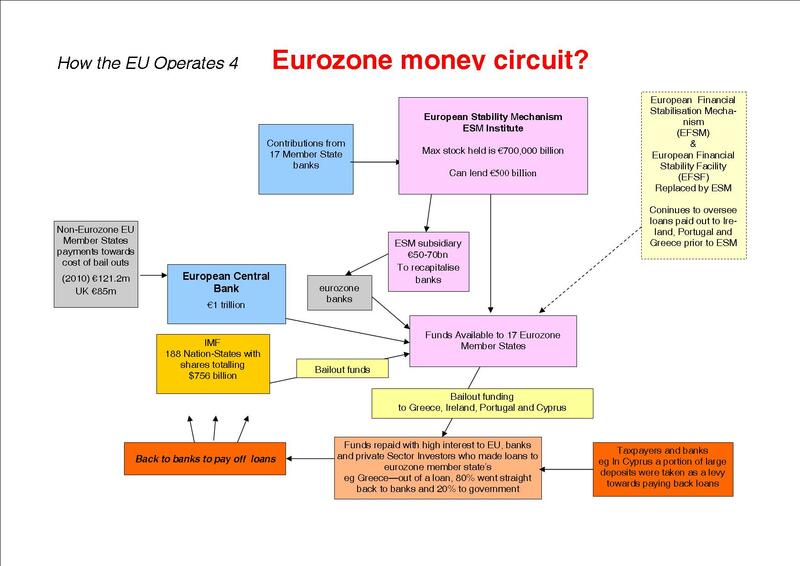 The main method used was to set up an unofficial sub-committee of the European Movement - an Action Committee for a United States of Europe in 1955. Two sectors were picked out to go alongside the ECSC - nuclear energy and a common market for trade. This was the period when Egypt nationalised and then blocking the Suez Canal, and intervention of the USSR in Hungary in 1956. The US government opposed the military invasion into Egypt by Israel, Britain and France to reclaim the Canal. This foreign policy declaration made clear the USA dominated militarily the capitalist world at that time. American foreign policy in this period, largely initiated by J Foster Dulles, was to set up similar blocs to NATO (1949-) under its control and included CENTO(1955-1979) in the Middle East, SEATO (1954-1977) in South East Asia and ANZUS (1951-) which involves the USA, Australia and New Zealand. This policy was nicknamed 'pactomania'. These blocs like NATO and the embryo Common Market had both military, economic and trade aspects.